Turkish led Combined Task Force (CTF) 151 has been working in association with NATO Task Force CTF 465 and the European Union Naval Force's Task Force CTF 508 in the Gulf of Aden, Somali Basin and Arabian Sea conducting Approach and Assist Visits (AAV) to local dhows, small cargo or fishing vessels. The AAV's are conducted with the consent of the dhow crew and are instigated to enhance awareness and cooperation in the maritime environment. This includes the aim of raising awareness of the CTF 151 mission and explaining how the behavior of dhows may be misinterpreted and a discussion as to how to avoid being mistaken for participating in piracy. 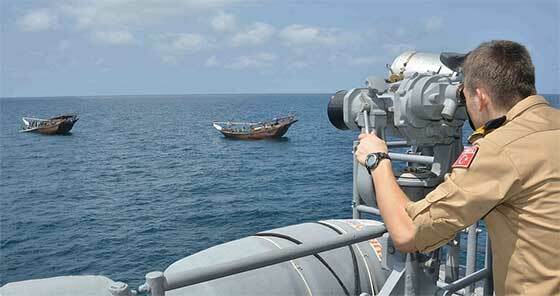 "In order to secure the maritime environment and provide prosperity in this part of the world, our objectives in this operation are enhancing multi-task force, multi-agency counter piracy cooperation and coordination, increasing understanding of the merchant and fishing community pattern of life in the region and reducing false alarm rates." The multi-national ships involved in the operation comprised of the Flagship TCG Gemlik from Turkey, PNS Aslat from Pakistan and JS Akizuki from Japan under the tactical control of CTF 151; HDMS Absolon from Denmark and ARC 7 De Agosto from Colombia under the tactical control of CTF 508; ESPS Victoria from Spain, HNLMS Groningen from Netherlands and FGS Erfurt from Germany under the tactical control of CTF 465. In addition to these surface units, German, Japanese, Pakistani and Spanish aircraft and several organic helicopters were also utilized. The overall operation has been supervised and monitored by Combined Maritime Forces based in Manama, Bahrain and conducted in the Gulf of Aden, Somali Basin and Arabian Sea.